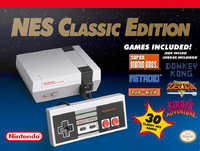 NES Classic Edition, titled Nintendo Classic Mini: Nintendo Entertainment System in Europe and Oceania and Nintendo Classic Mini: Family Computer in Japan, was a miniature video game system by Nintendo. It was sold for a limited time beginning in November 2016. Despite strong demand and the inability to keep up with demand, Nintendo initially discontinued the system on April 13, 2017. In August 2017, after a strong demand for the system's follow-up, the Super Nintendo Entertainment System Classic Edition, Nintendo announced they would produce more NES Classic Edition systems in 2018. However, both the NES and SNES Classic Edition consoles were snnounced to be discontinued on December 14, 2018, and ceased production in 2019. On July 7, 2018, Nintendo released a special edition in Japan to commemorate the 50th anniversary of the Weekly Shonen Jump comic, titled the Nintendo Classic Mini: Family Computer - Weekly Shonen Jump 50th Anniversary Version. This version contained 20 games that tied into Weekly Shonen Jump and the mini-console was colored gold. The original systems contained thirty built-in games, while the Weekly Shonen Jump version contained 20 games. It was designed to resemble the Nintendo Entertainment System in North America, Europe, and Oceania, and the Family Computer in Japan. It contained a proprietary menu and emulator by Nintendo European Research & Development to run the games, as it was powered by an Allwinner R16 chip with a 1.2 gigahertz CPU, rather than the MOS Technology 6502 chip with a 1.79 megahertz CPU that powered the system it was designed to resemble. The only differences between the system released in North America compared to the system released in Europe and Oceania were the name and packaging. The system itself, the controller, the games, and the system software are identical. Both versions came with the same 30 built-in games that ran on an emulator developed by NERD. Both versions contained one controller, was modeled after the original rectangular gamepad, that had a three-foot cord that connected to the system via a Wii Classic controller port. Both versions also had a second port that could be used for another controller. The power was provided by a standard mini USB plug and wall adapter, and the video was output through HDMI. The standard Japanese release, on the other hand, was quite different. While it used the same emulator and also had 30 built-in games, some of them were different from the Western release. 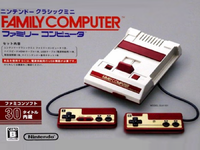 This version was modeled after the Family Computer and had miniature built-in gamepads modeled after the original Famicom controllers. Unlike its Western counterpart, the Japanese release did not have Wii Classic Controller ports built-in and relied on the included miniature controllers, which were hard-wired to the system. The Nintendo Classic Mini: Family Computer - Weekly Shonen Jump 50th Anniversary Version was colored gold and contained an entirely different set of games from the standard Japanese edition. It had 20 built-in games that tied into the comics that appeared in Shonen Jump. These games ran on the same emulator as the standard releases, however, some of the graphics and music in the emulator's user interface are exclusive to this limited edition console. Both Japanese releases contained controllers hardwired to the system, however, it is possible to add Wii Classic Controller ports to the Famicom Mini without damaging the unit. The system itself is much more powerful than the system on which it is designed. Since it uses common architecture, all regional variations of the system can be modified to add additional games, simply using the supplied mini-USB cable and open-source software. The following table lists the games included in the NES Classic Edition and the Famicom Mini. This page was last edited on 17 April 2019, at 10:09.